The sports staff of the Boston Globe and Boston.com bring you the early word on the Red Sox from Fenway Park or on the road. We'll deliver live updates when there's Sox news on weekday mornings and afternoons, and we'll be in Terry Francona's office before each game, reporting pregame news and lineups. 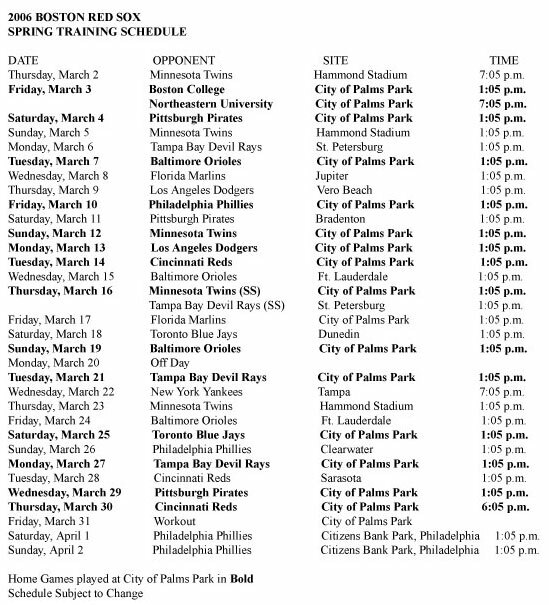 The Red Sox today announced their 2006 spring training schedule, which will feature 32 games -- 16 at City of Palms Park in Ft. Myers. Tickets will be available beginning at 10 a.m. on Saturday at the City of Palms box office, on the Internet at www.redsox.com, or by calling (617) 482-4SOX. For accessible seating, call (877) RED-SOX9. Hearing-impaired fans can call (617) 226-6644. The Red Sox open their spring schedule on Thursday, March 2, when they travel across Ft. Myers to take on the Minnesota Twins at Hammond Stadium. They make their City of Palms Park debut the following day with a 1:05 p.m. game against Boston College and a 7:05 p.m. contest against Northeastern University. The Sox will host the Florida Marlins for the traditional St. Patrick�s Day game on March 17 (1:05 p.m.). They face the Yankees just once, on Wednesday, March 22 in Tampa. After 30 Grapefruit League games in Florida, the Red Sox will conclude the 2006 spring schedule with a pair of games against the Phillies at Citizens Bank Park in Philadelphia April 1 and April 2. The Red Sox open the regular season April 3 at Texas.